13 Comments on A Forge and a Purse. That’s All We Need. Oh, and Cake. Plus This Candle. And a Bow Staff. A Unicorn. I want always to remember who he was at this stage of life: sweet, sensitive, musical, bull-headed, mellow, clever, rules-minded, funny, soft, self-conscious, smart, observant, intuitive, sometimes anxious. In other words, he’s exactly who he’s always been–only with every passing year, he’s less of a Creature Who Needs Tending and more of a Comfortable Conversation Companion. He just gets better. All of the traits that were in him when he was two are magnified a decade later. The only difference now is that he accessorizes less when he sings his happy little songs. 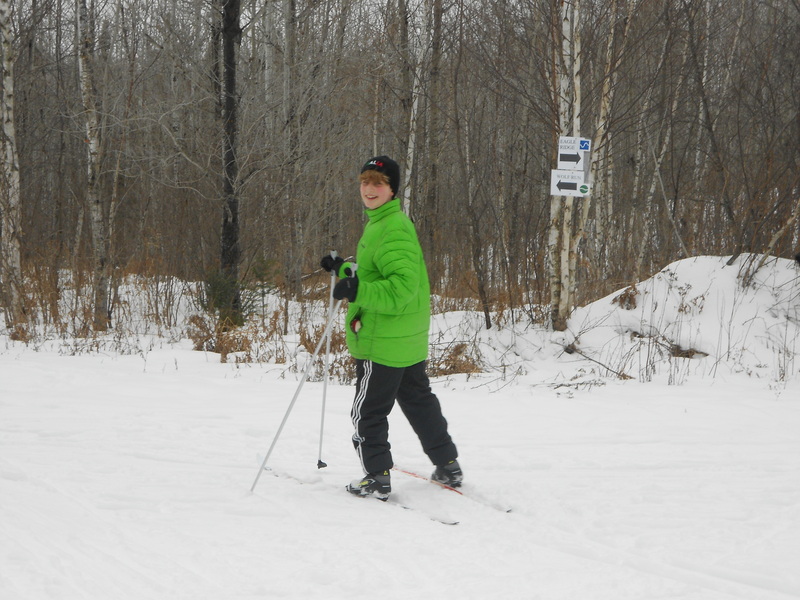 In the week before his birthday, Paco took part in two activities that illustrate the breadth of his abilities. First, he completed a day-long blacksmithing class, the foundational course in a series; six days later, he went purse shopping with his mother. 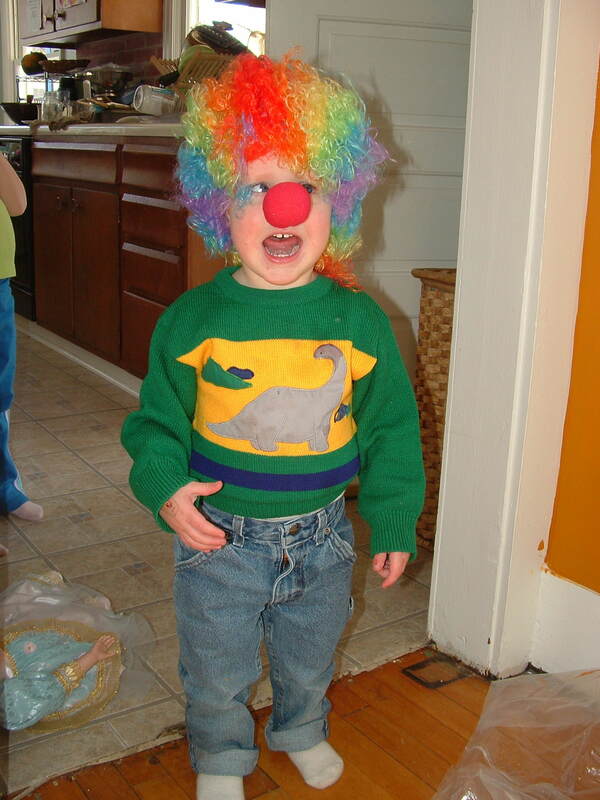 He could have handled either of these as a two-year-old, as well, but the parent in me was grateful he’d outgrown his clown wig phase before standing over the fire in a forge. Too much risk of a stray spark igniting a purple patch of whizzy curls before leaping cheek to smolder on the red nose. I’m also fairly certain the two-year-old Paco, had he been drafted into helping select a new purse, would have been more interested in choosing a shiny gold one with rivets, leopard spots, and a dangling whistle for himself than counseling his mother into the best choice of bag. True confession: part of me wishes my twelve-year-old were still interested in choosing a shiny gold purse with rivets, leopard spots, and a dangling whistle for himself. We would use it to tote scones and bottles of mineral water when shoe shopping–and to signal each other when stumbling across a noteworthy find (Trumpet that whistle: Dansk clogs are on clearance!). Alas. His interest these days is weaponry. 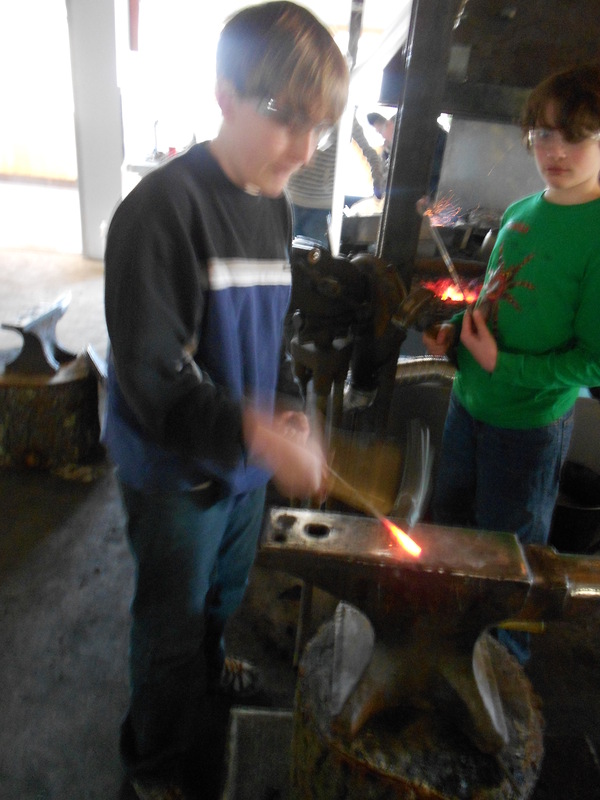 That’s what led him to the forge: he wants to make a sword. Of course, the road to a sword starts with a single step, in this case Blacksmithing 101, during which he learned to build and tend the fire before whacking at rods of rebar with a hammer for six hours. The day after the class, our almost-twelve-year-old was whupped. This was not surprising; one of the descriptors listed above with regards to this lad should also have been “low energy” or, phrased more gently, “easily sapped by activity.” He gets that from his mother. After a day of significant exertion, he feels run over; there is no quick rebound or shout of “Where’s the unicycle? I need a balance challenge!” Nae. This kid will need to lie on the couch for a good ten hours the day after effort, persistently promoting the nuances of his sore neck. He will sleep with a heating pad for two nights. He will accept ibuprofen and massages. He will nestle his brain stem on only the softest of fleecy fabrics. When the bathroom calls, he will walk gingerly, guarding his person against offending walls. I feel this child. I am this child. Seriously. One time I had a C-section, and from the way I still go on about it, you’d think the surgeon used nothing but a dull butter knife and her left incisor to cut me open. Interestingly, the ball of blood and tears the surgeon gnawed out of me that day was this very kid, the one who’s just turned twelve. When he forgets to moan, there is no one better. 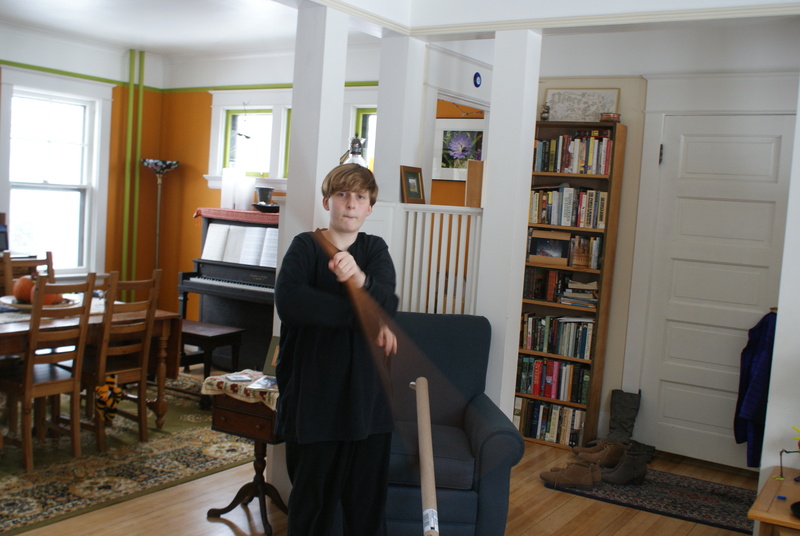 He works diligently at learning to spin his new bow staff, acting out Daffy Duck and Porky Pig’s famous “Guard! Turn! Parry! Dodge! Thrust!” scene as he twirls. 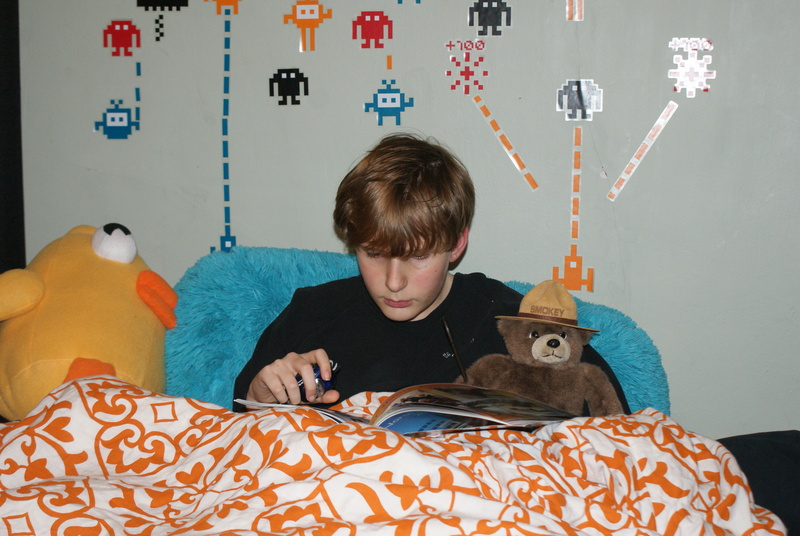 He loves his softie buddies in the bed and invites them to read in the dark with him, using a head lamp to illuminate a Nate the Great or Rick Riordan book. And he goes purse shopping with his mother. It was a spontaneous outing. I’d noticed that my year-old purse’s straps had worn through and were on the verge of giving way entirely. I figured that at some point I’d dash into my favorite store and seek out a new one. That opportunity presented itself the night before Paco’s birthday. He and I–teeming with vitality and non-sore necks when I suggested an expedition to check out the newest series of Lego mini-figures–had driven to the shopping area in town and done some focused groping of various bags of mini-figs, attempting to discern which figures might be held within the mystery packets. 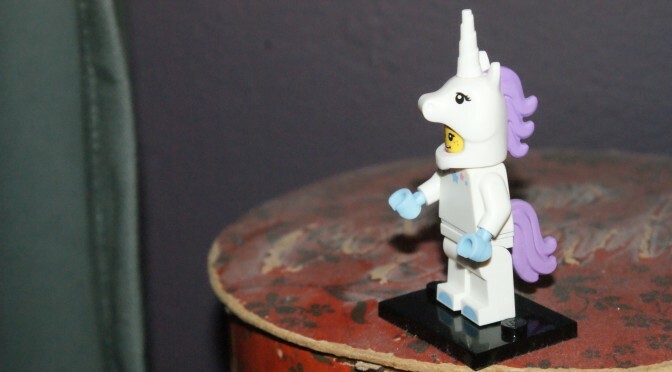 More than anything, we were hoping to detect a unicorn horn; to turn twelve the next day while clutching a Lego unicorn would be, well, like being the forty-seven-year-old mother of a twelve-year-old clutching a Lego unicorn: THE APEX OF AWESOME. Once we selected our bags of figures and made our way out to the car (“I’m going to open one now and one tomorrow on my birthday; since I’m not having a party this year, that gives me something to look forward to”), I noted that we were conveniently near my favorite store. When we got to The Mothership, he had no interest in wandering off and looking at things that might interest him. He never does. Always and forever, he would rather stick close. Better conversation that way. Hip to hip, we entered the square footage of Purse. He posed a hard question–for the criteria are variable, so long as the purse speaks. It’s a love thing. Negotiable, kid. I won’t know ’til I see it. It’s a love thing. Teachable moment: you get what you pay for, buddy. Sometimes, when a purse has nice shape and is soft, that’s because it’s well made. I clutched it to my chest and petted the softness, just as I had this boy when he was a baby. Moving to the clearance rack, our eyes were drawn to a bright blue bag, smallish, zippered-but-not-too-much. “Ooh, I like that one,” I got squealy. I grabbed the bright blue purse and smashed it against the navy blue one. Cuddling two babies, I followed my young man. He was right. 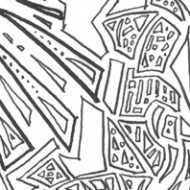 In fact, rack after rack, every time I tried to derail my original intentions (Jocelyn Superpower #47) and get excited about impractical, silly, or ridiculous, the last-night-as-an-eleven-year-old’s voice brought me back from the edge. The racks of green purses. Green and I have a history. Green might actually be Paco’s father. Our steps slowed; our fingertips grazed. Green was promising. I helped him extract it from the tangle of purses. It was lime green all right. I realized that–on the cusp of my son’s twelfth birthday–this was a moment to tuck into my heart. The next few years will see him moving further away from me, separating healthily and painfully; he will always be my boy, but he’s about to become less and less my boy, more and more the world’s man. He will always be part of my pulse, yet I will miss him forever. Rather than yielding to the wash of melancholy that threatened, I focused on what he was right then, in that moment, in The Mothership, standing next to the green purses, enthusiastically holding up his choice. Almost as tall as I, this young man was sweet, sensitive, musical, bull-headed, mellow, clever, rules-minded, funny, soft, self-conscious, smart, observant, intuitive, sometimes anxious. And he was applying all of his everything to helping me with my cause. There was no question. Even if he’d been holding up a red purse dripping with sequins and fringe gilded with seven gold chains, I would have bought it. LOVE the bag. I’ll need to borrow your boy sometime. But I do beg to differ on one point: One can never have too many bags. The trying phase of baritone sax possibly excepted, there is nothing hard to take about this boy. Twelve is a magical age. I love kids that age. Thanks for sharing him. I loved shopping with him, and I hate shopping. The green bag is perfect. I do so love this post. You have captured the best of an almost-teen gentle helpful boy so very well. (Or girl. Either can both be like this at a certain stage.) Do your kids know that you write about them? What a treasure to give a child. I was doing great until “He will always be part of my pulse, yet I will miss him forever.” The keyboard is now well salted. My boy will be 13 dreadfully soon, and he’s suddenly started transmogrifying from boy into young man and the process is so beautiful it hurts to watch. Thank you. And your purse is fabulous, dahlink. And I love your kid. I love every nuance, every word, every lovely, heart squeezing place of mother/ son bond in this gorgeous piece. You’ve got quite a son and he’s got quite a mom. I enjoyed this so much I came out of blog retirement to comment. Oh, dear. I can’t do the lime green, but I SO wish that I could. 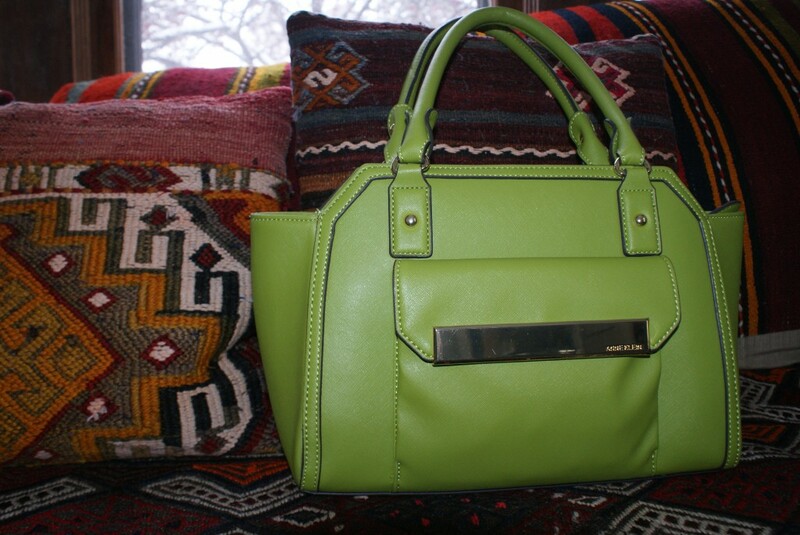 I want to be the kind of person who slinks around wearing a lime green purse, but no…I lack razzle dazzle. I always buy the SAME kind of purse and I am addicted to them. I have to have really soft leather and it has to be brown. And it has to have lots and lots of little cubbies for my keys, my meds (type one diabetic…it can get crazy…) pens, and ipod. I can never find one that I like for under 200 smackers. But, I love it that your son is so good at all of this and knows you so well. My daughter would show me two totally weird looking saddle bag thingees and then sigh and walk away…. Shoot. I’m all verklempt now and weeping a little. Nailed it, the whole business. Please tell me it took you 427 painstaking hours to complete this post. Gorgeous. The dead lizard line was (one of) my fave(s). Also, I don’t believe I’ve ever uttered these words to anyone before, but love the purse. That is a fabulous purse, but better yet is the personal shopper! Some woman, some day, is going to be so grateful to you for nurturing the Renaissance in your Little Man. That is a truly fabulous purse, but better yet is the personal shopper! Some woman, some day, is going to be so grateful to you for nurturing the Renaissance in your Little Man.